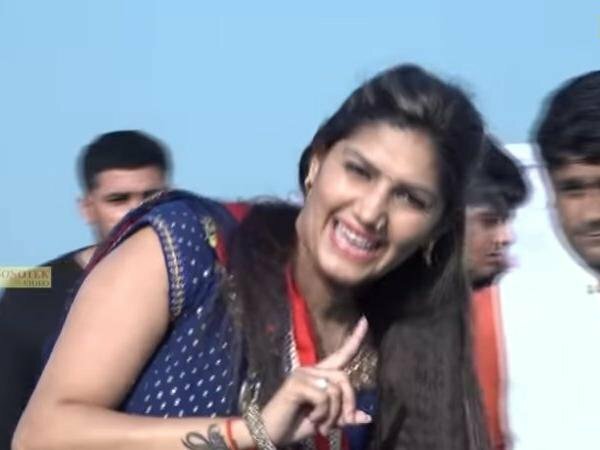 Ace Haryanvi Dancer Sapna Choudhary Rocks On A Slow Track!! Haryanvi fame dancer and singer Sapna chodhary is an ace dancer who sparks current as she steps on the stage. Sky is the limit for her dance whose every bit of move is filled with energies and zeal. She loses herself completely while giving performance and her fans never stop themselves from hooting when she is on stage. Most of her dances are on a fast note, but this time her dance video over a slow track is rounding at the social media with complete madness. Its her record that whenever she is on stage, Pandaal rocks with her performance. Her new slow track dance over the song “Tajamahl si chamak gouri” has been viewed by 2 cr and 87 lac people in which she is donning in a blue shirt and Mehroon salwar is not a highspeed song, but still making a hit at the social media. Written by Ajay Hudda and sung by Gagan this song succeeds in making people go crazy. Born in Rohtak, Sapna has gathered a huge fan base at the social media who has performed on many item numbers in hindi and Bhojpuri. Student Of The Year 2 poster out, trailer to be unveiled on this date!!! Hina Khan’s Yellow Outfit leaves Many Dumbfound!! !